Synthetic peptide within Human IRSp53 aa 492-518 (C terminal) conjugated to keyhole limpet haemocyanin. The exact sequence is proprietary. 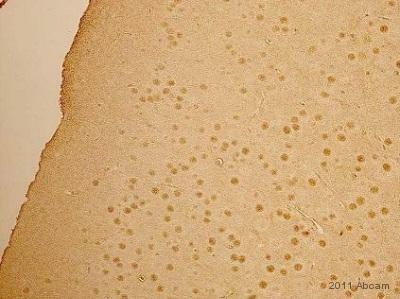 Mouse brain tissue lysate, A375 cell lysate and human breast carcinoma tissue. Our Abpromise guarantee covers the use of ab37542 in the following tested applications. WB 1/100 - 1/500. Detects a band of approximately 57 kDa (predicted molecular weight: 57 kDa). Formalin-fixed and paraffin-embedded Human breast cancer tissue reacted with ab37542, which was peroxidase-conjugated to the secondary antibody, followed by AEC staining. Publishing research using ab37542? Please let us know so that we can cite the reference in this datasheet. Does Abcam sell the corresponding immunogen for ab37542, i.e. a KLH-conjugated synthetic peptide (10-30 aa in length) at the C terminal of last 50 aa of Human BAIAP2? 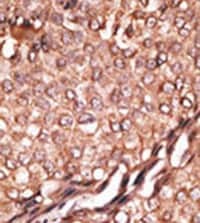 Does EXPOSE Mouse and Rabbit Specific HRP/DAB Detection IHC Kit have the same sensitivity as the EXPOSE Rabbit Specific HRP/DAB Detection IHC Kit? I have contacted the lab who have agreed to add the blocking peptide for ab37542 to the catalogue. The product is called BAIAP2 peptide, ab170411.